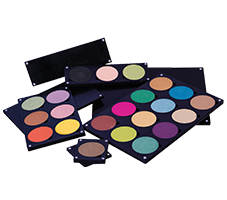 Fourteen pre-selected eyeshadow combinations to highlight and contour the eyes. May be customized â€“ special order of 1 with the same color scheme and package (no exceptions). Choice of black matte or silver compact with mirror, double end brush and window to see colors. Long lasting with excellent payoff.